Small - $53.99 Only 1 left! Medium - $53.99 Large - $53.99 Only 1 left! X-Large - $53.99 Only 3 left! It is also a time where things that normally do not move around begin to rise up, charged by the energy of the atmosphere, to wander, explore, and hopefully be full of cheer… hopefully. A variety of once inanimate objects occasionally take to life. When these are cute stuffed puppies or even simple colorful decorations, that’s one thing. But, when the spirits of the night animate a few creepy painted dolls, who knows what is going to happen! With threats like that looming around, we need a profound goddess who can guide those spirits to where they are destined. It is time for the Queen of the Dead to rise and take her gloried throne for the grand holiday and you are just the perfect person for the job. This lovely polyester pullover dress rests just off the shoulder and has a fascinating skeleton screen printed throughout its front face. The black skull veil has a comfortable plastic headband with brilliant red flowers to keep the holiday festive. 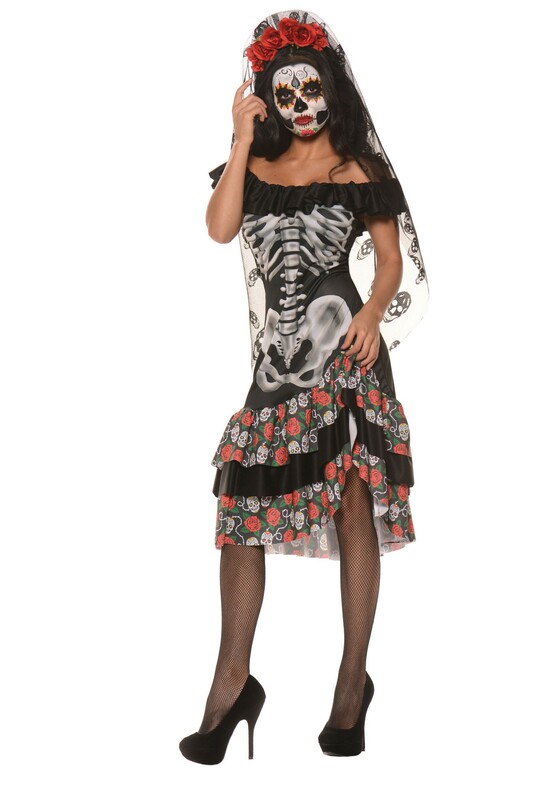 Finish off with a sugar skull design make up for your face, some castanets and the most mischievous smile you can manage and this day of the dead will be one for the record books.